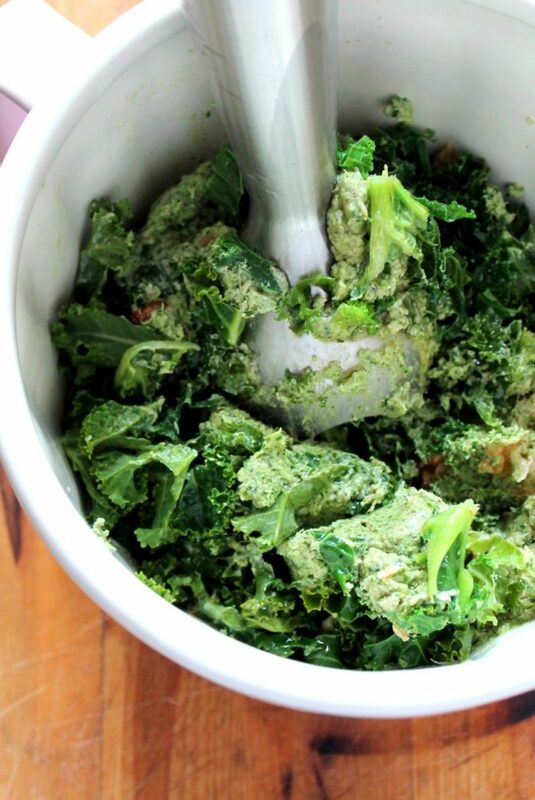 Once all your kale is steamed, you could put everything into a big powerful food processor, if you have one. I actually used a hand blender. It worked beautifully. I put all the ingredients into a large bowl, and then used the hand blender in a very targeted way which allowed me to completely control the texture. I put the garlic cloves in, poured over a little oil, and then made sure they were totally pureed with some kale right there in that spot. Then I moved the blender to where the walnuts were, and blended those into some kale and avocado, but left them a little chunky. Once all those bits were the right texture, I mixed it all around and then used the blender to blend the bits of kale which were still whole, just a little bit, leaving some chunks. Does that sound complicated? It wasn’t. I’ve made it a few times now, just to make sure the method wasn’t a fluke, and each time it worked out great. 1) You really shouldn’t skimp on the garlic and lemon. They add so much of the flavor and if you reduce the amount, it can taste a little bland. 2) If you’re going all-out healthy and using a wholewheat pasta, make sure it is a brand you have eaten before and liked the taste of. 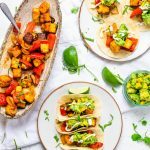 They can vary a lot, and this recipe will showcase the flavor. I made this once with an unfamiliar brand of spaghetti which has a much more, erm, wheaty(? ), taste which I didn’t like at all. 1) Mr. Veggie doesn’t love this all on it’s own. He feels like it needs some vegetables mixed in, maybe peas or roasted tomatoes to add sweetness and to make every bite a little different. I am happy with it alone, but I see his point. 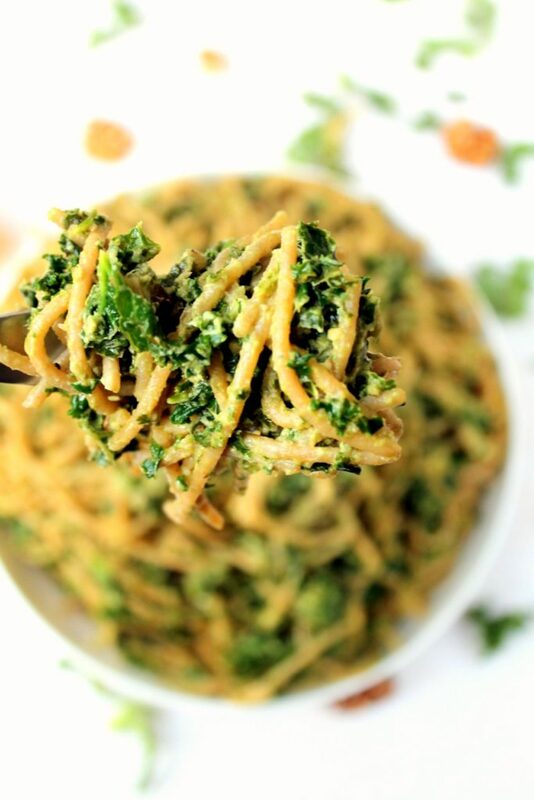 A big bowl of pesto pasta can be kinda same-y, and this has a really strong, distinctive taste. So it’s well worth experimenting with some other toppings and veggies mixed in. 2) I like this even better cold, the next day. I rarely feel that way about pasta, but for whatever reason this really rocks the leftovers. So maybe it would be a good base for a vegan pasta salad. One last thing to note! You will see that I put “1-2 avocados”. The spaghetti pictured has one, but I sometimes make it with two. With two, it goes super creamy and rich. With one, it’s more tangy and garlicky. Take your pick! 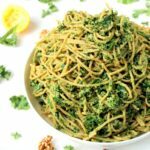 This quick, easy kale avocado pesto pasta is a deliciously simple recipe, with a creamy texture and tons of flavor. 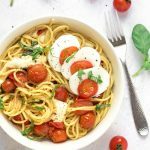 A super healthy but comforting vegetarian and vegan pasta dinner! Start by lightly steaming the kale. I used a steaming basket which sat in a saucepan to do this in two batches. 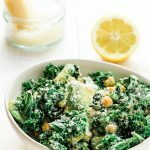 You want to get the kale a little softened, without properly cooking it. It will take just a couple of minutes and will turn bright green. Now start cooking your pasta. Bring a large pan of water to the boil and add your spaghetti. While it’s cooking, you will make the pesto. 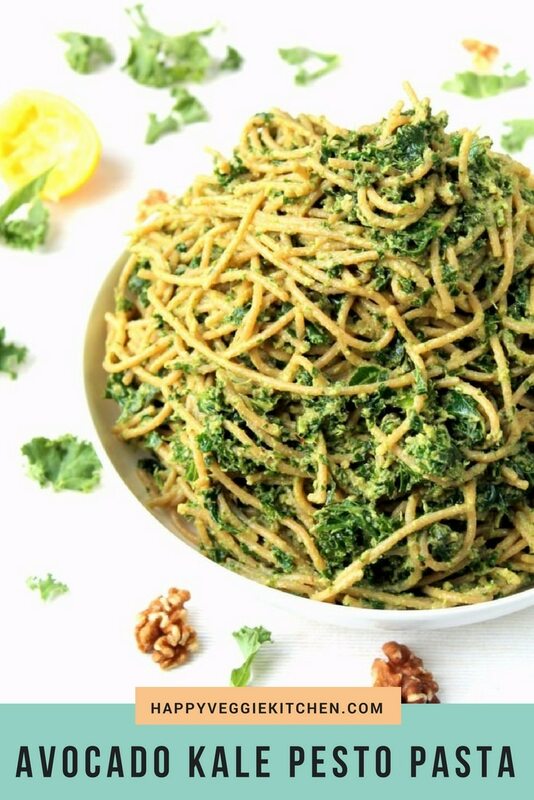 If you have a large food processor, put the kale in with the walnuts, avocado, garlic, lemon juice and olive oil and pulse until it’s blended but still chunky. 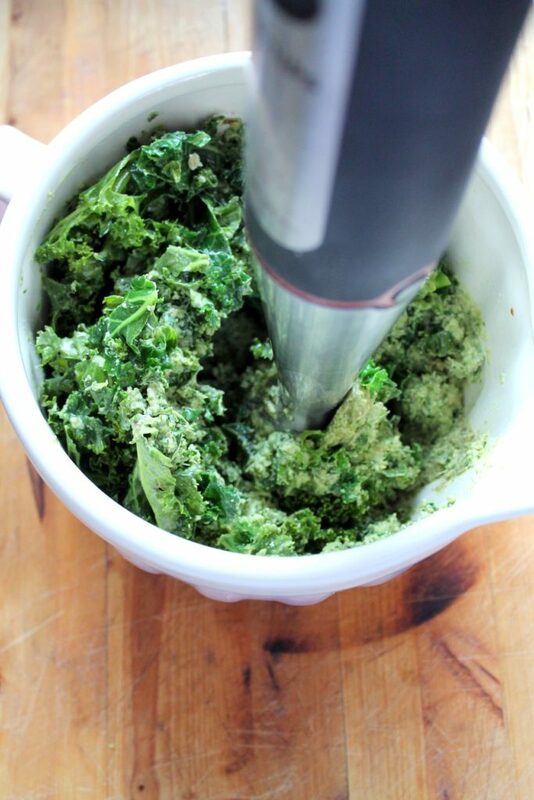 If you’re using the hand blender method as I did, put the kale into a large bowl. Pour in the lemon juice. 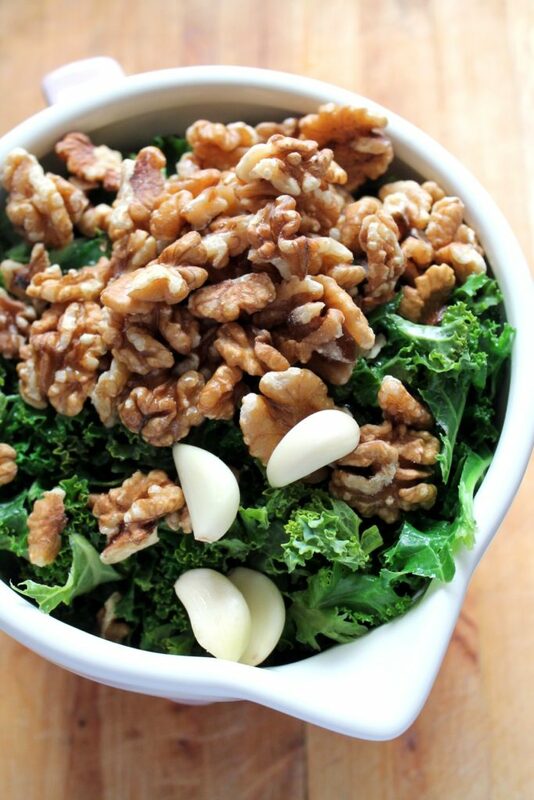 Place the walnuts and garlic on top of the kale and pour the olive oil over them. Press the hand blender down over all of the garlic cloves and blend until the garlic is completely pureed in that spot. Now move the blending stick around and blend all of the walnuts (these can be a little chunkier) and kale to achieve the desired texture. Some bits of kale could be left almost whole if you’d like it more textured. When the pasta is ready, drain and return the pan. Top with the pesto, add salt and pepper to taste, and then use tongs to distribute it. 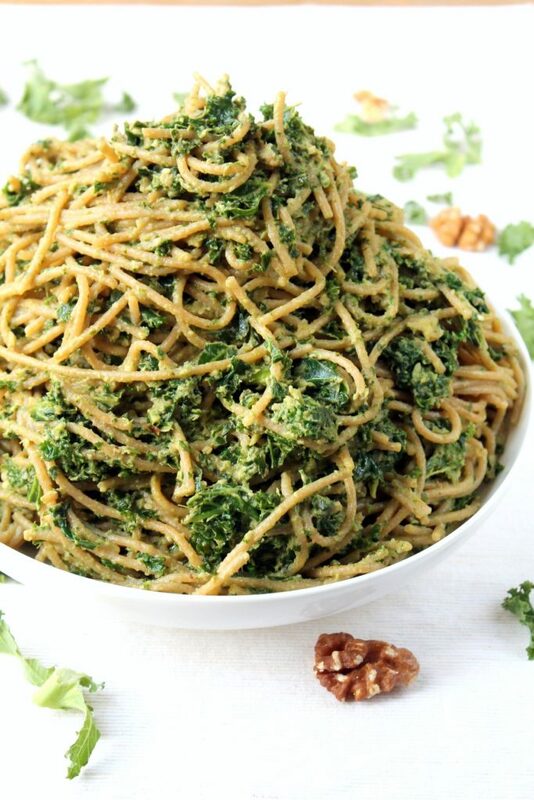 It can take a lot of work to get the pesto mixed in, because the kale sticks together a lot! You may need to add a little more oil. Wow, I love this recipe! I never thought to use kale like that. This is def a good substitute for basil leaves, especially basil leaves are not always fresh in Britain. We made this tonight–only used one lemon and one avocado and zoodles instead of pasta. It was delicious! And the whole thing came together in just a few minutes. Thanks! Yay! So happy to hear this! And with zoodles, how amazingly healthy. I really need to get over my fear of zoodles and try this! Hooray! 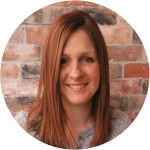 I am so happy to hear this and I love the idea of trying it with cashews – I will give that a try myself next time 🙂 Thank you for sharing your feedback. Made this tonight, having to substitute with cashews, orange juice, frozen shredded kale, and garlic powder. I’ve never had pesto before, and this was my first attempt at making it so I had no clue what it was supposed to turn out tasting like. My omnivorous husband is a pesto fan, and he went back for seconds! I’m calling that a hit. Thanks so much! Thank you so much for the feedback! I am very happy that my recipe was your first foray into pesto-making, you should totally try more! Pesto is the best! This was awesome! Just made this, and it was so much easier and quicker than I thought. I used almonds instead of walnuts, and for the pasta used Trader Joe’s brown rice/quinoa GF fusilli. Best way to use up a bunch of kale that I was scared would go bad soon.The bomb. Thank you so much for the recipe! 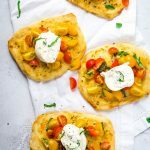 This recipe is great! I’m typing as I wait for my pasta to cook, and have had a sneaky taste of the pesto… amazing! I’m serving mine topped with nutritional yeast, toasted walnuts & seeds, and some fresh tomatoes and pickled beetroot on the side. Can’t wait! Yaaaay! That sounds like heaven in a bowl. Enjoy!